2019 Silver Eagle Roll - 20 Gem BU American Silver Eagles - Free US Shipping! 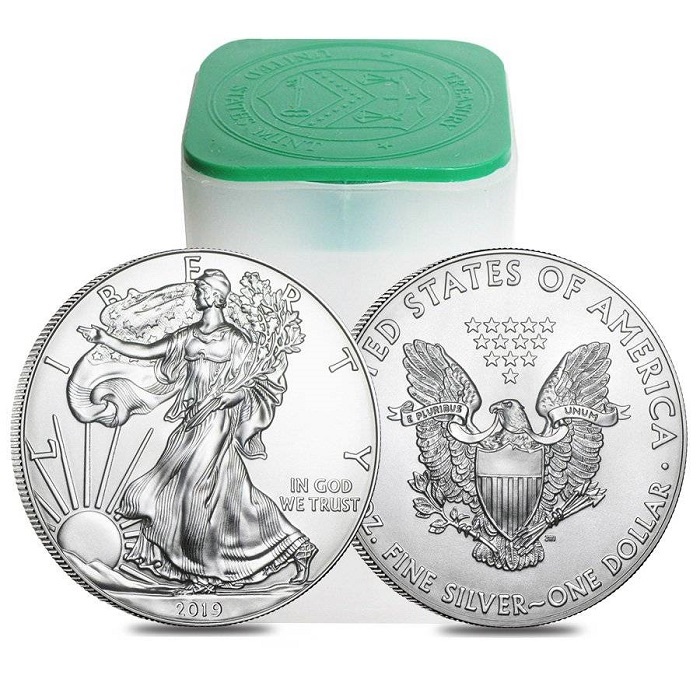 2019 Silver Eagle Rolls - NOW IN STOCK! The Silver Eagle Coin Company is pleased to offer mint fresh 2019 Silver Eagle Rolls, just released! Each roll contains (20) GEM Brilliant Uncirculated coins, each coin contains one ounce of 0.999 pure silver. These rolls come directly from a mint-sealed green monster box (500 coins) and are not searched or "cherry-picked" for perfect coins. We do not "slab" silver eagles and sell off the rejects like many other dealers. We simply take a mint roll from a newly opened green monster box, tape the lid shut for safe travel, and ship it to you. (NOTE: The U.S. Mint recently changed the silver eagle tubes by making them slightly taller so the green top fits better. However, to prevent the coins from "rattling together" during shipping, we insert a piece of foam inside the mint tube before sealing the top securely with tape. Contrary to popular belief, rolls are never "mint sealed" like some dealers advertise. Ours are "dealer sealed" for maximum protection during shipping.) Minor flaws or blemishes are possible. Perfect coins are also possible. The coins are exactly as we receive from the U.S. Mint with no returns permitted. 2019 Silver Eagle Rolls are available at $380.00 per roll (Insured U.S. shipping included). To order, please click the button below. 2018 Silver Eagle Rolls - STILL AVAILABLE! Copyright © 2019, Silver Eagle Coin Company. All rights reserved.